Italy’s Interior Minister and Deputy Prime Minister Matteo Salvini (L) looks on flanked by Italy’s Foreign Minister Enzo Moavero Milanesi (R) and Italy’s Family and Disability Minister Lorenzo Fontana (bottom) during a debate ahead of a confidence vote in the Italian Senate in Rome. Italy’s railway chief announced his resignation Thursday accusing the government of implementing a “spoils system” after new Transport Minister Danilo Toninelli dismissed the company’s entire board. 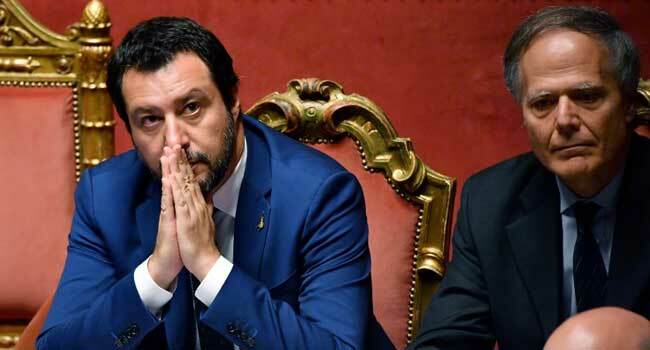 Mazzoncini was made the head of state-owned Ferrovie Dello Stato Italiano (FS) in 2015 by former Prime Minister Matteo Renzi’s centre-left government, fierce rivals of Toninelli’s party Five Star Movement, which has governed alongside the far-right League since last month. “After just less than three years, following the decision of the new government to apply the spoils system (in which a government replaces a state company’s hierarchy with party loyalists), I’m stepping down from the role of CEO of FS,” said Renato Mazzoncini in a statement to employees. Toninelli signed off on dismissing the FS board on Wednesday, saying in a Facebook post that there needed to be a “break with the past” and that it was a matter of ethics. The board will be replaced in a shareholder’s meeting set to be held before the end of the month. Last month Mazzoncini was ordered alongside three others to face charges of fraud relating to the falsification of data involving a transport company in order to gain six million euros ($7 million) of public funds. Italian media reported that the ministry forced the FS board to step down due to its non-observation of an “ethical clause” that meant they should have launched proceedings for Mazzoncini’s justified dismissal. Toninelli is also a critic of the merger between FS and the Italian highways agency ANAS completed in January, calling it a ” definite mistake”. Under his guidance, Mazzoncini continued in his statement, FS produced an average profit of 645 million euros over the last three years, “a 60 percent increase on the three years before”. Net profit last year was 554 million euros. “Today FS is worth two percent of Italy’s gross domestic product, directly employing 81,000 people and creating work for a further 240,000 people,” he added. Mazzoncini’s predecessor Graziano Delrio, a leading member of the Democratic Party formerly headed by Renzi, blasted the move as being carried out “only to satisfy the appetites of the parties”.